Which Tallahassee Neighborhood Sells The Most Homes? If you are a long-time reader of the Tallahassee Real Estate Blog, then you most likely know that we track a lot of home sales information from nearly every Tallahassee neighborhood that has had a sale in the past twenty years. This is no small feat as there are over 1,600 neighborhoods in Tallahassee. In doing some of my previous reports where I showed the most active Tallahassee neighborhood as Southwood, I was often reminded by readers that there was a mistake in my report and that Southwood was not indeed the most active in home sales. You see, because I report Killearn Lakes and Golden Eagle Plantation separately, some readers feel that I then should also report different units of Southwood separately. I have decided not to do that, mostly due to time constraints and usability of the final reports. I will acknowledge that more home sales occur in the Killearn Lakes Plantation community than all others in Tallahassee. Now, on to our report showing the top Tallahassee neighborhood. 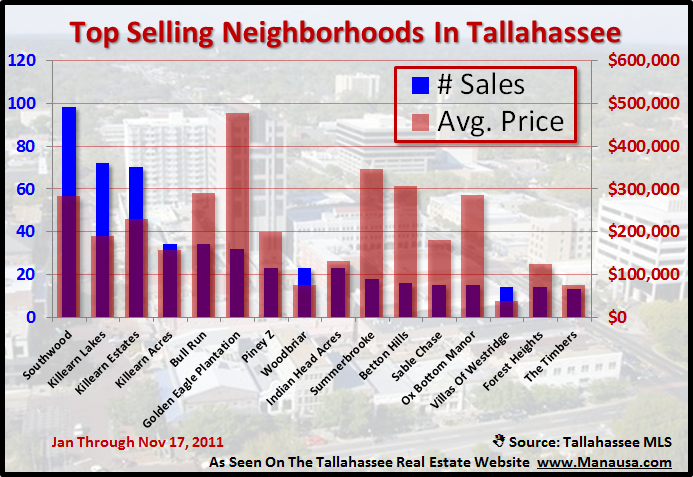 Our November Housing Report shows that Southwood is still the top selling Tallahassee neighborhood. With 98 closed home sales through mid November, Southwood beats out Killearn Lakes, Killearn Estates, Killearn Acres, and Bull Run as its closest competitors. 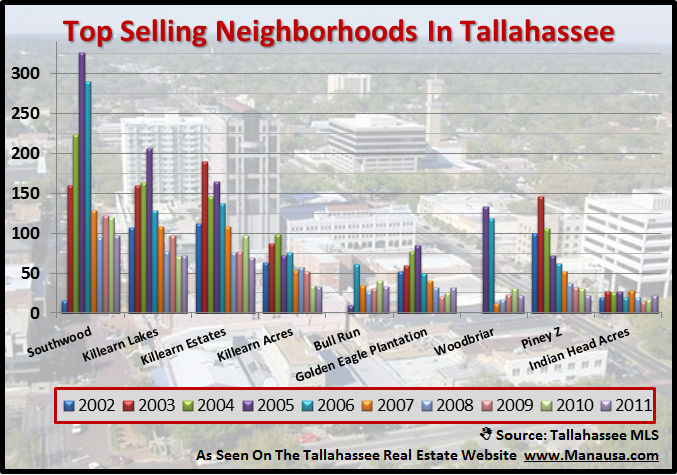 The graph below shows the top selling neighborhoods in Tallahassee, with sales plotted for each year going back to 2002. The following real estate graph shows the top 16 selling neighborhoods in the Tallahassee real estate market, with a measure of total sales and each subdivision's average home sales price. They represent about 1 of every 6 home sales thus far in 2011. The following information is a Tallahassee neighborhood home sales list which shows all subdivisions with four or more home sales thus far in 2011. The first 15 neighborhoods include a hyperlink to homes for sale in their respective subdivisions.